Princess Juliana was in trouble. The country over which she would someday reign was in crisis and her life was in peril. The Nazi blitzkrieg was pushing its way north and west and her beloved Netherlands was certain to fall to Hitler’s mad ambitions. Just three years before, with the encouragement of her mother, the powerful and extraordinarily wealthy Queen Wilhelmina, she had married a young German aristocrat named Prince Bernard of Lippe-Biesterfeld. They soon fulfilled the most important part of their royal duties by producing heirs. Princess Beatrix was born in 1938 and then, a year later, Princess Irene. Despite suspicions of all things German, the Dutch people accepted Prince Bernard. He changed the spelling of his name to be less German and became a Dutch citizen. Now they worried about their future, the future of their country, and that of the Royal bloodline if the Princess and her family were captured by the Nazi horde about which astounding stories of unspeakable horror were being told. The Royal family was evacuated to London. Queen Wilhelmina oversaw the creation of a Dutch government in exile. A month later, in June 1940, Princess Juliana and her family were sent to an even safer sanctuary in Ottawa, Canada. A spacious house was found in the tony neighbourhood of Rockcliffe Park, home to ambassadors and the city’s elite. The house was called Stornoway. It would later become the residence of the leader of Canada’s Official Opposition. Juliana followed the tragic news of her country having fallen under the Nazi yoke as she worried about her mother enduring the London blitz. The shy princess led a quiet life and remained aloof from Ottawa society events to which she would have been welcomed. Problems arose in late 1942 when she found herself pregnant. If she gave birth in Canada, the child would have dual citizenship and so be robbed of a spot in the Royal line of succession. The Canadian government came to the rescue. It declared her rooms in Ottawa’s Civic Hospital to be temporarily extra territorial. In other words, for the moment, Juliana was in the Netherlands. Princess Margriet was born on January 19, 1943. The child became the first, and remains the only, royal personage to be born in North America. Canadians were as pleased as the people of the besieged Netherlands. The news led Canadian radio broadcasts and adorned newspaper front pages. The Dutch flag fluttered atop the Parliament Building’s Peace Tower and its bells chimed out the Dutch national anthem and folk tunes. Meanwhile, the war raged on. Successful D-Day landings by British, American, and Canadian troops initiated a slow and bloody push toward Berlin. Canadians were assigned the left flank and, in September 1944, they began the liberation of the Netherlands. It was tough. The Nazi army had flooded land, mined ports, and dug itself into intractable defensive positions. The Dutch people did what they could to offer fifth column help. So many were so hungry that they had been surviving by eating tulip bulbs. Many were saved when Royal Canadian Airforce planes dropped food for the starving. Canadian troops fought gallantly. The Battle of the Scheldt was the most excruciating engagement. Between October and November 1944, the Canadian First Army suffered nearly 13,000 casualties. When it succeeded and Nazi forces retreated, Canadian soldiers were hailed as heroes. As they entered Dutch towns, the tired but smiling young men were showered with flowers and gifts. 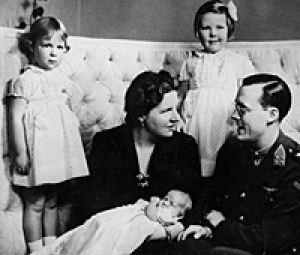 On May 2, 1945, after five years in Canada, Princess Juliana and her children were able to return first to London and then, along with Queen Wilhelmina, to a freed and free Netherlands. To demonstrate their gratitude for all that Canada had done for the country and her family, the Princess arranged that 100,000 tulip bulbs were sent to Ottawa. The next year, 20,000 more arrived with the request that they be planted on the hospital grounds. In 1948, as result of her mother’s long illness, Juliana, became Queen. She ensured that more tulip bulbs were sent to Canada every year. Every spring saw Ottawa resplendent in a riot of colour. 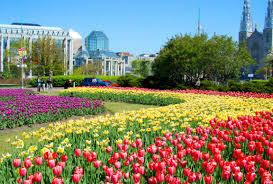 In 1952, at the suggestion of noted Canadian photographer Malak Karsh, Ottawa began an annual Tulip Festival. The city hosted a celebration that grew to include concerts, buskers, plays, fireworks, and more. Every year the city’s tulip beds grew even more spectacular. In Canada’s centennial year, 1967, Queen Juliana was enthusiastically cheered as she enjoyed the festival. In 2002, Princess Margriet was the special guest commemorating the festival’s 50th anniversary. This weekend my family will be enjoying the festival. We’ve been before. It is spectacular. The flowers, so fragile and lasting only a short while, are reminders of a friendship within a tragedy and of our common humanity. They remind us of what can be lost to the insanity of war and blind adherence to a hateful ideology. And, standing boldly in the spring breeze, they symbolize the assurance that after every winter follows the spring and the determined hope that we may someday be sufficiently mature to live in peace. This is a rare second column in what is usually a weekly blog. If you like it, please share it with others and consider leaving a comment. ← What Can We Learn from Leviticus, Wealth, and the Monkees? John, I recently subscribed to your blog after finding it through Lakefield College School’s social media. I want to thank you for your thoughtful and thought provoking essays which I am enjoying immensely. This particular one strikes a chord, as my father was born in 1938 in Holland and came to Canada, along with many others from Holland in 1955. He remembers being liberated as a young boy on a dairy farm in Debilt, Holland. It is good to remember the special place Canada still holds in Dutch hearts and the roots of that unbreakable connection. Thank you for reminding us what it was like for the Dutch Royal family, their literally starving, brave Dutch people and our valiant Canadian soldiers. Thank you so much for your kind words. The bonds between the Canadian and Dutch people are strong indeed and deserved to be remembered. Although I knew the “big picture” story of the tulips, I was unaware of all of the intricate details you provided in your blog. As I have said before, you have a great gift, being able to turn a history lesson into an amazing learning experience, and leaving the reader wanting more! Thanks for your kind words Nancy.